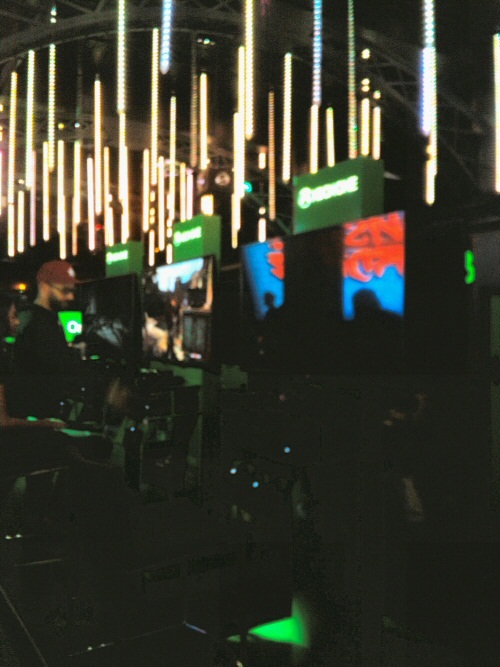 On September 10th we finally had the chance to go to one of the Xbox events in Toronto. It's amazing how close we are but the timing is never right... We were definitely excited to be able to play some of the upcoming blockbuster Fall titles and discover some new indie gems as well. The show floor reminded me of the very small E3 back in Santa Monica at the Barker Hangar:, a very private event, nice and cozy, but also loud, and with the usual sensory overload going on. Thanks to the amazing city traffic, we got there just in time for our first demo, where we got a close look at Halo: The Master Chief Collection. If it had been socially acceptable, I would have drooled! The collection is presented via a master menu that allows for faster access to all the games. Every level within the game is unlocked, so you are able to pick a stage to play, add some modifiers like vehicles, or sit and play the entire campaign from Halo to Halo 4. In the multiplayer front, there are over 100 maps and an interesting way to pick what you want to play. Chose the type of game and it will group you with other players who want to play the same game. From there, everyone votes on the game they want to play and the one with the most votes wins. For the anniversary treatment, we get Classic Mode, where we can see the game as it was 10 years ago and instantly switch to the new and improved version, which has had an impressive graphic and audio makeover. After checking out other details and watching an impressive trailer, we had to move on to our scheduled Fable Legends demo. Fable Legends is recommended for four players, so when playing on your own you will have three A.I.-controlled heroes with you. We played the co-op mode, which isn't your usual campaign, but places an evil mastermind against four adventurers. Gil took the villain seat and did great, since he killed us all in the end. 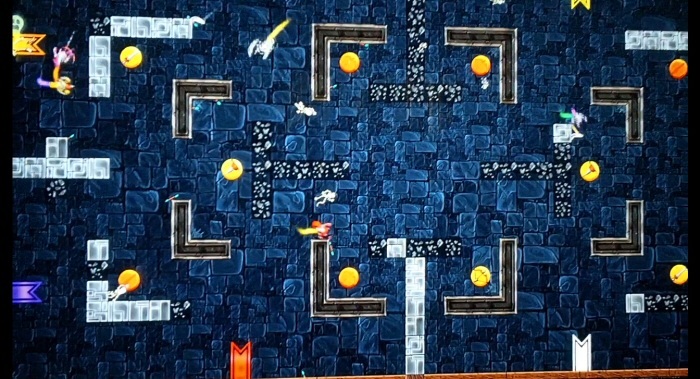 From his Dungeon Keeper position, it may not look so impresive, as it's a birdseye grid view tower defense type of strategy game where you place pre-made obstacles. The action takes place on our side, so from out point of view, it was crazy with the land mines, the ranged attacks, the locked gates blocking our way to enemies, and the smoke grenades... those were brutal! You really can't see a damn thing inside that smoke. One thing I thought the game was lacking was some sort of direction, either an overhead arrow, a mini-map, so we had some clue where to go. Fable Legends will feature over a dozen of pre-made heroes to choose from each with their own unique abilities. I'm glad, since I found out I'm not so great at being a tank, but jumping into a game with no training usually has that drawback, I'm sure with a playthrough of the campaign first I'd get the hang of it. 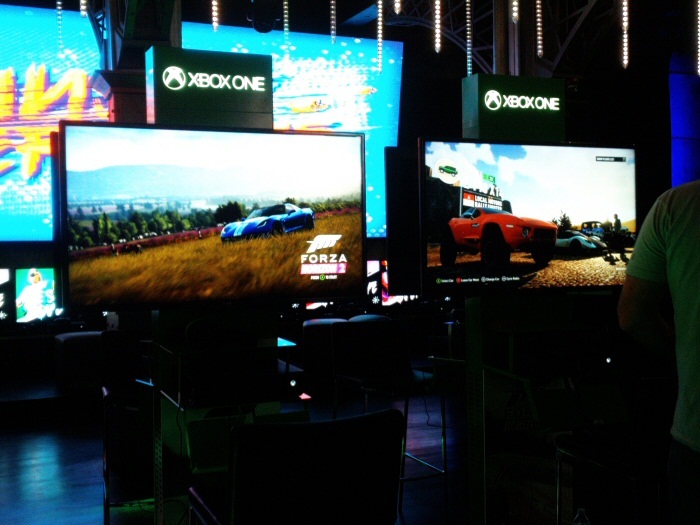 We were scheduled for a Forza Horizon 2 demo, but an interview was taking place so we roamed around to see the rest of the games. 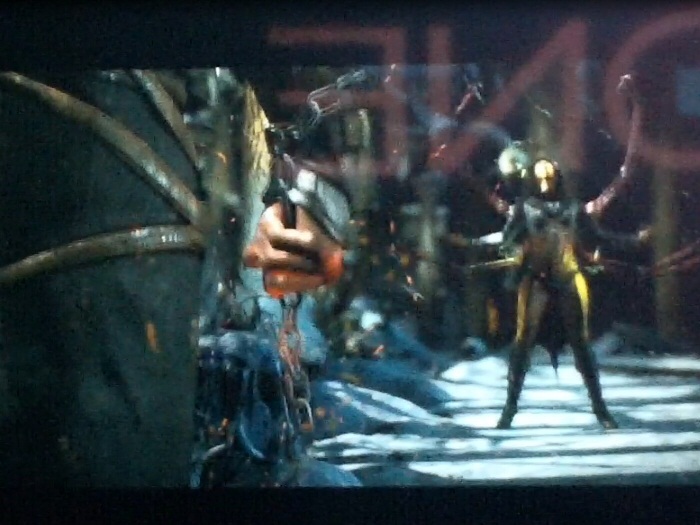 While the focus of the event was to get to know the major titles of the upcoming Holiday lineup, it was quite the surprise to see other games appear on the demo stations: Ori and the Blind Forest, Dying Light, Killer Instinct Season 2, Shape Up!, Dance Central 2015, Alien Isolation... but I didn't have a clue we'd get to see Mortal Kombat X! That was unexpected, and there was some serious competition to play it, but we were happy to see the available characters and some of the gameplay. 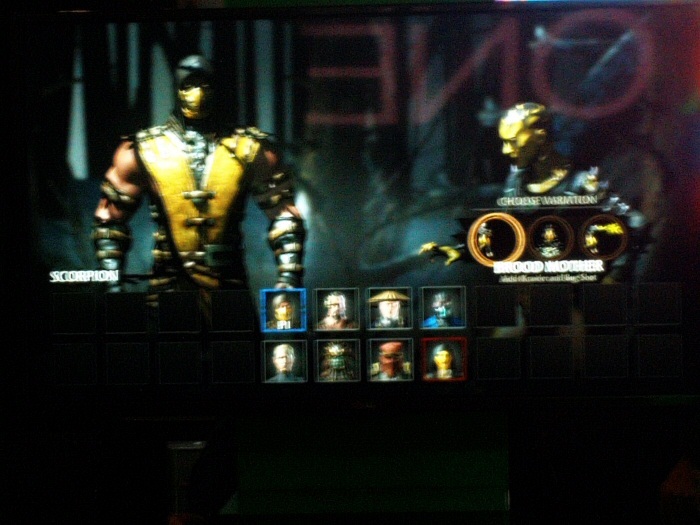 On the character selection we had the familiar faces of Sub-Zero, Raiden, Scorpion and Kano, with new fighters D'Vorah, Kotal Kahn, Cassie Cage, and the duo Ferra & Torr. 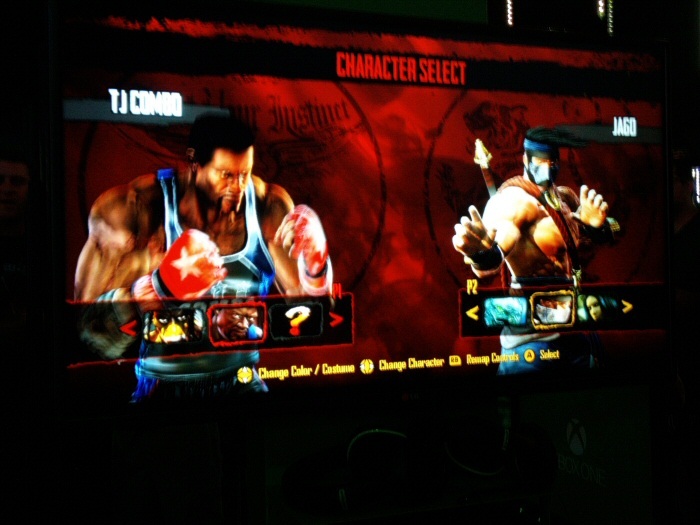 Upon selecting your character, you can choose one of three available fighting styles and a costume variation. 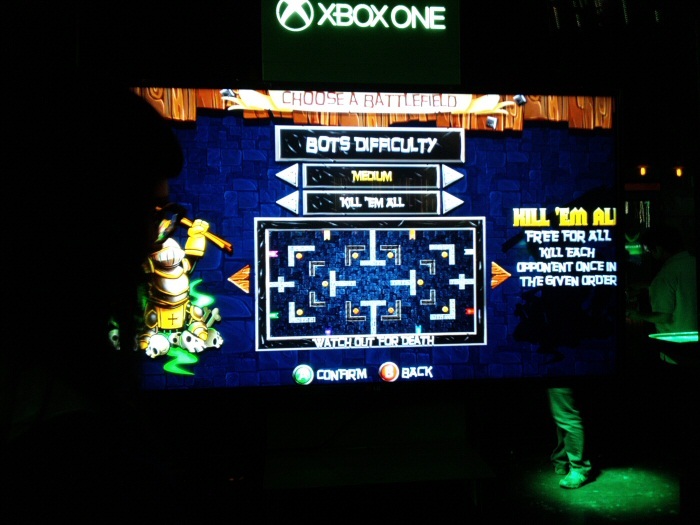 Four arenas were playable, all featuring destructible environments. We were able to witness some of D'Vorah's super cool and completely over the top attacks for our own personal amusement. We then had a little chat with Jeff Rivait (Platform Marketing Manager) and Nicole Fawcette (Category Manager, Xbox Games & Accessories) about... you guessed it, more games! There is a lot going on for Xbox One this year, and gems can be found among the indie games as well. We took a closer look at three of the upcoming ID@Xbox titles. Knight Squad was a blast, a fun multiplayer Gauntlet-style, every player for themselves type of game where you run around picking up power-ups and killing everyone else. It's chaotic and a lot of fun. 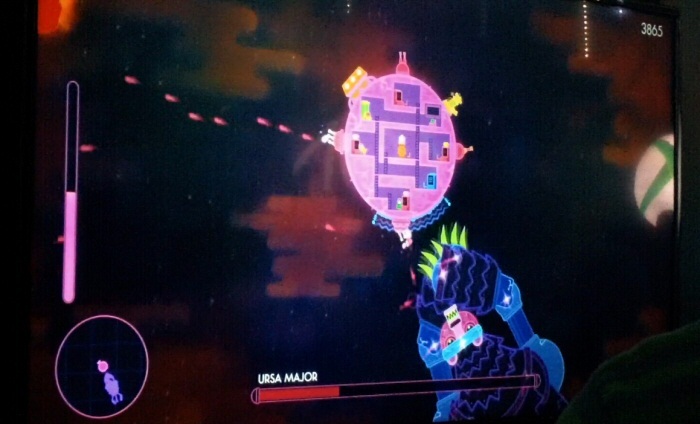 Next to it, we stopped to look at the curious Lovers in a Dangerous Spacetime, a co-op space shooter where each player controls an aspect of the spherical ship, either the different stations inside or the steering. Each person can only control one station at a time, so it's similar to a two player FTL, where you must manage your resources strategically. I can see this being a good teamwork and communication exercise. For some. I'm sure for others it can be the start of some crazy arguments too. 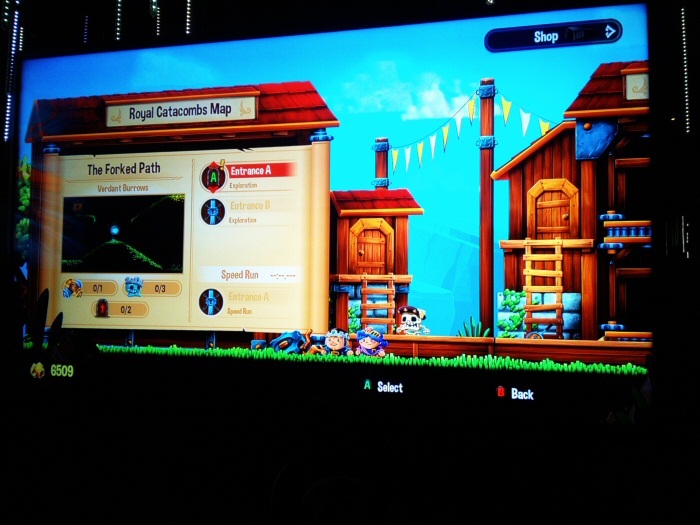 Chariot, another co-op game, seemed childish, cute and silly but we actually stood there and played it for quite a while. Beyond the cuteness lies a macabre premise, where the two characters drag their father's coffin across the world, to find a more suitable resting place. You can push the coffin, pull it by latching a rope onto it, and jump on to use it as a platform, as both work to get past obstacles in side-scrolling platform type of environments. It wasn't as easy as it initially seemed, but we were sucked right into it and into the coordinated teamwork required to progress. We also got a quick overview of Project Spark, which is both a game and a game maker, with a lot of potential for creating and sharing. We were also told about Champions Quest, which is basically an RPG where you can learn the basics of the game, learn the mechanics while progressing through the adventure. Like Minecraft, Project Spark will be a dynamic game where gameplay will be kept fresh by releasing new content packs. 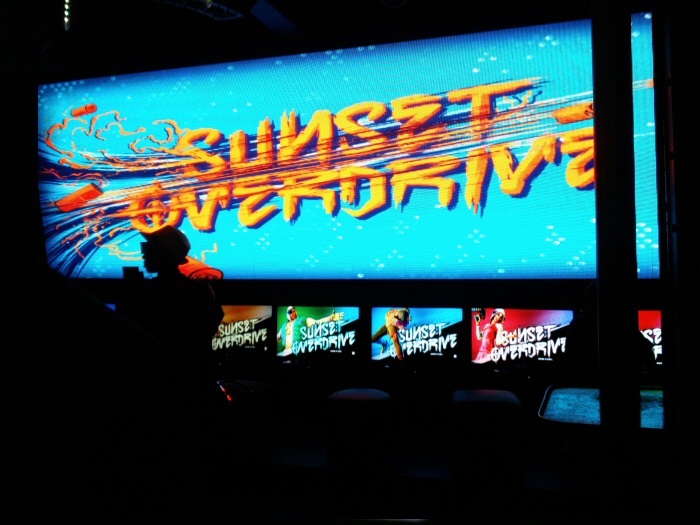 The last hands-on experience was with Sunset Overdrive, which I had been looking forward all day. Each of us jumped on to a random seat, each featuring a different character. With a crash course on controls, we were thrown into the game: our goal was to defend from the incoming attacks. We were encouraged to take high ground and keep on grinding and wall running while shooting, but it didn't take me long to realize I sucked at attempting these feats, so I just kept to the ground and concentrated on shooting everything that moved. And you know what? That worked for me. There is a good variety of weapons to play with and we can also set traps at the beginning of the round. I wasn't expecting this to be a co-op 8-player tower defense at all, but once I started playing, and then at the end when I ended up taking first place with the top score, I was even more excited than before I started. This means if I can play it and do well, everyone will be awesome at it! Also awesome is the Fizzco plush doll I brought home. I'm glad that we finally had the time to meet up with the Xbox Canada team. Although we are about an hour away, it's not easy to find the time for the events during the week, so I'm really happy to have finally met some of the names I see in my inbox all the time, and to get some hands-on game time with some of the coolest titles coming up this Holiday season. It certainly looks like it will be an exciting one!